Are you prepared for your next food safety audit, customer audit or third party audit? Chemical Distributors, Incorporated's Food & Beverage Division has developed a program solution for master sanitation scheduling which is both flexible and easy for all employees and management to use. 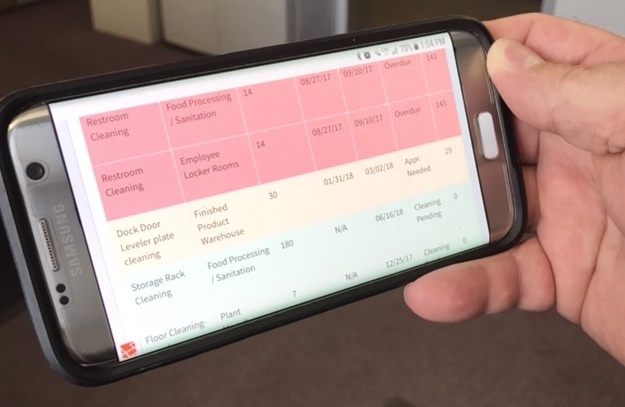 This is a new concept for master sanitation scheduling with a special focus on making sure that all periodic duties are completed and documented with reduced labor cost. Crimson Halo is a cloud-based preventative maintenance scheduling program, which can be used for all sanitation, maintenance and other departmental verifications of completed duties. It can also incorporate all of your periodic internal inspections and daily inspection verifications. It is an umbrella program which can incorporate all food safety duties and verifications into one simple-to-use platform that includes verifications for employees and all levels of management - from the people doing the tasks, to the corporate manager who needs to view conformity. The program provides multi-layer levels of secured access which can be used by anyone granted permission. You have to do no loading of data, additions or changes; just simply send an email describing what you need done and it is done for you. It is a fully-loaded, turnkey program, which is developed and maintained for your company's exact needs - all your employees have to do is use it. For example: Your employee looks at their worklist and knows what needs to be completed during the current week. Comes the closest to Halo's versatility and ease of use. However, the appointed power user needs to load all of the duties, create and write procedures, and set up all users. With Halo, this work is completely done for the user. And with our onsite training, all users can start using the exact program during the training session. Halo is built and customized for the exact needs of each processing location. This allows for a true turnkey startup. Also, any changes are updated as needed by an email request. Nexcor will only update Kleanz™ on a quarterly basis. Clunky, hard to use, overwhelming, Excel®-based software that has to be maintained on your computer. Madison Sanitation Scheduling Software only works well with one user accessing it. Updates take time to install and require a sophisticated computer operator. The software needs to be repaired by a professional if problems occur. This program shares the same 24 procedures for all jobs in the plant, which requires the user to type in new information for every task. This, combined with printing, requires several hours per week maintenance. This also does not come pre-loaded and must be set up by the user.